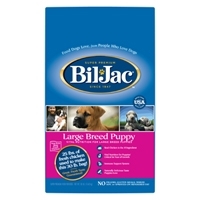 Bil-Jac Large Breed Puppy food has been carefully formulated for the care and nutrition of Large Breed Puppies. Carefully formulated for the care and nutrition of Small Breed dogs. Our small, easy-to-chew bites are made with Chicken, Oatmeal and Yams. 5 lbs. of fresh chicken are used to make a 6 lb. 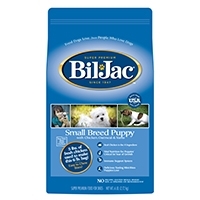 bag of Bil-Jac Small Breed Adult Dry Dog Food. Some dogs have a tendency to gain weight, which is not healthy. With 30% less fat than Bil-Jac Adult Select, Bil-Jac Reduced Fat Dog Food can help manage your dog’s weight while maintaining a beautiful coat and muscle tone. 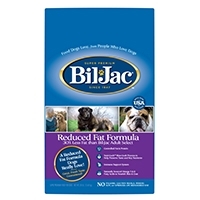 Plus, dogs love the fresh chicken taste of Bil-Jac Reduced Fat Formula, which is rare among reduced fat dog foods. 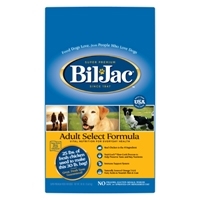 Bil-Jac Adult Select Formula is specially formulated with the nutrients your adult dog needs. 25 lbs. of fresh chicken are used to make a 30 lb. 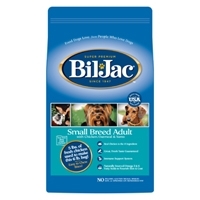 bag of Bil-Jac Adult Select Dry Dog Food. Slow cooked in small batches for outstanding nutrition and taste.